Mytoolsoft Watermark Software 5.0.7 Free Download - Add watermark to your photos in batch mode, quickly and easily. The useful watermark software &amp; batch watermark software &amp; easy watermark software. Add text watermark or image watermark to your photos quickly and easily. Protect your photos without unauthorized distribution. Allow individually setting in batch process. support multiple picture formats: bmp, jpg, jpeg, gif, png, tiff, etc. Freedom of set positon and styles. such as multiline text, angle, margins, tile, shadow and opacity. ratain the EXIF information. rotate images, drag and drop, resize output images and convert format in batch mode. Auto calculate watermark size.Add date stamp to photos. Add Copyright tag, Rigister Tag, Trademark Tag to your photos. Add camera maker, camera model to the photos. friendly user interface, what you see is what you get. support drag &amp; drop files and folder. auto save watermark setting and output setting. Statement: First, please download the orginal installation package by clicking the download link. Of course you may also download it from the publisher's website. Using Mytoolsoft Watermark Software crack, key, patch, serial number, registration code, keygen is illegal. The download file hosted at publisher website. We do not provide any download link points to Rapidshare, Hotfile, Depositfiles, Mediafire, Filefactory, etc. or obtained from file sharing programs such as Limewire, Kazaa, Imesh, Ares, BearShare, BitTorrent, WinMX etc. Software piracy is theft. 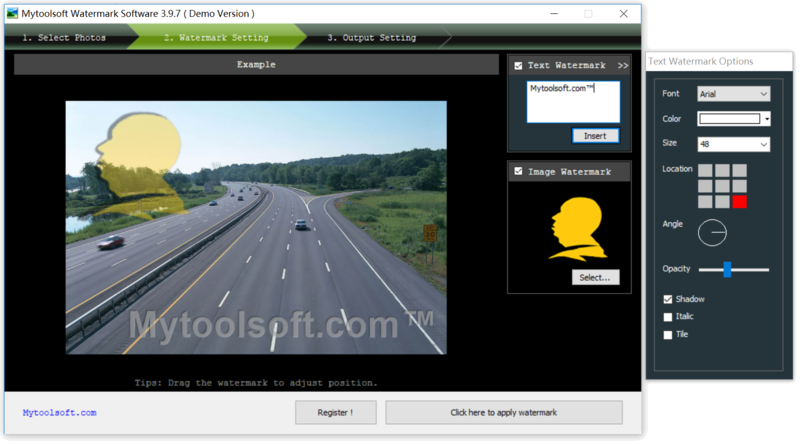 If you like Mytoolsoft Watermark Software please buy it.